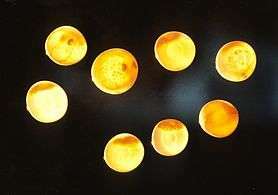 This article is about biological eggs. For eggs as food, see Egg as food. For other uses, see Egg (disambiguation). An egg is the organic vessel containing the zygote in which an animal embryo develops until it can survive on its own, at which point the animal hatches. 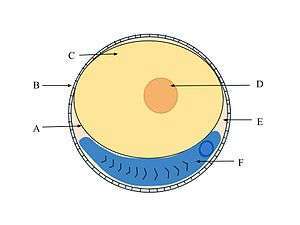 An egg results from fertilization of an ovum. Most arthropods, vertebrates, and mollusks lay eggs, although some do not, such as scorpions and most mammals. 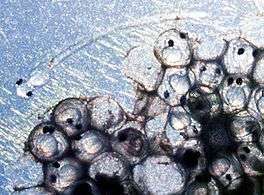 Reptile eggs, bird eggs, and monotreme eggs are laid out of water, and are surrounded by a protective shell, either flexible or inflexible. Eggs laid on land or in nests are usually kept within a favorable temperature range (warm) while the embryo grows. When the embryo is adequately developed it hatches, i.e. breaks out of the egg's shell. 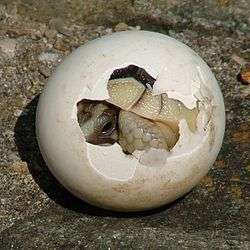 Some embryos have a temporary egg tooth with which to crack, pip, or break the eggshell or covering. The largest recorded egg is from a whaleshark, and was 30 cm × 14 cm × 9 cm (11.8 in × 5.5 in × 3.5 in) in size; whale shark eggs normally hatch within the mother. 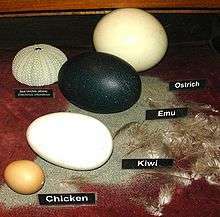 At 1.5 kg (3.3 lb) and up to 17.8 cm × 14 cm (7.0 in × 5.5 in), the ostrich egg is the largest egg of any living bird, though the extinct elephant bird and some dinosaurs laid larger eggs. The bee hummingbird produces the smallest known bird egg, which weighs half of a gram (around 0.02 oz). The eggs laid by some reptiles and most fish can be even smaller, and those of insects and other invertebrates can be much smaller still. In species such as the common guillemot, which nest in large groups,each female's eggs have very different markings, making it easier for females to identify their own eggs on the crowded cliff ledges on which they breed. Tiny pores in bird eggshells allow the embryo to breathe. The domestic hen's egg has around 7500 pores. 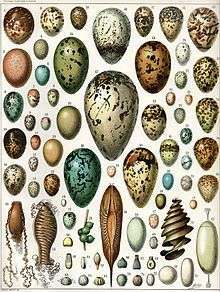 Most bird eggs have an oval shape, with one end rounded (the aerus) and the other more pointed (the taglion). This shape results from the egg being forced through the oviduct. 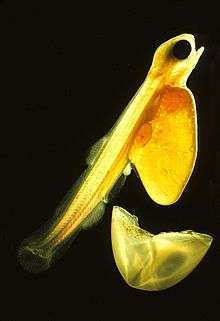 Muscles contract the oviduct behind the egg, pushing it forward. The egg's wall is still shapeable, and the pointed end develops at the back. Cliff-nesting birds often have highly conical eggs. They are less likely to roll off, tending instead to roll around in a tight circle; this trait is likely to have arisen due to evolution via natural selection. In contrast, many hole-nesting birds have nearly spherical eggs. 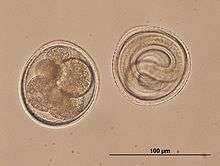 In placental mammals, where the egg is nourished from the mother throughout the whole fetal period, the egg is reduced in size to essentially a naked egg cell (zygote). A popular Easter tradition in some parts of the world is the decoration of hard-boiled eggs (usually by dyeing, but often by spray-painting). Adults often hide the eggs for children to find, an activity known as an Easter egg hunt. A similar tradition of egg painting exists in areas of the world influenced by the culture of Persia. Before the spring equinox in the Persian New Year tradition (called Norouz), each family member decorates a hard-boiled egg and sets them together in a bowl. The tradition of a dancing egg is held during the feast of Corpus Christi in Barcelona and other Catalan cities since the 16th century. It consists of an emptied egg, positioned over the water jet from a fountain, which starts turning without falling. Although a food item, eggs are sometimes thrown at houses, cars, or people. This act, known commonly as "egging" in the various English-speaking countries, is a minor form of vandalism and, therefore, usually a criminal offense and is capable of damaging property (egg whites can degrade certain types of vehicle paint) as well as causing serious eye injury. On Halloween, for example, trick or treaters have been known to throw eggs (and sometimes flour) at property or people from whom they received nothing. Eggs are also often thrown in protests, as they are inexpensive and nonlethal, yet very messy when broken. ↑ "Whale Shark – Cartilaginous Fish". SeaWorld Parks & Entertainment. Retrieved 2014-06-26. ↑ D.R. Khanna (1 January 2005). Biology of Birds. Discovery Publishing House. p. 130. ISBN 978-81-7141-933-3. 1 2 Gorbman, A. (June 1997). "Hagfish development". Zoological Journal. 14 (3): 375–390. doi:10.2108/zsj.14.375. ↑ Hardisty, M. W., and Potter, I. C. (1971). The Biology of Lampreys 1st ed. (Academic Press Inc.). ↑ Leonard J. V. Compagno (1984). Sharks of the World: An annotated and illustrated catalogue of shark species known to date. Food and Agriculture Organization of the United Nations. ISBN 92-5-104543-7. OCLC 156157504. 1 2 3 4 5 6 7 Romer, A. S. & Parsons, T. S. (1985): The Vertebrate Body. (6th ed.) Saunders, Philadelphia. 1 2 Stewart J. R. (1997): Morphology and evolution of the egg of oviparous amniotes. In: S. Sumida and K. Martin (ed.) Amniote Origins-Completing the Transition to Land (1): 291–326. London: Academic Press. ↑ Solomon, S.E. (1987). Egg shell pigmentation. In Egg Quality : Current Problems and Recent Advances (eds R.G. Wells & C.G. Belyarin). Butterworths, London, pp. 147–157. ↑ Gosler, Andrew G.; James P. Higham; S. James Reynolds (2005). 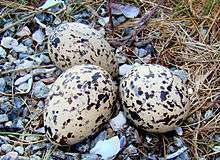 "Why are birds' eggs speckled?". Ecology Letters. 8: 1105–1113. doi:10.1111/j.1461-0248.2005.00816.x. ↑ Newman, S.A. (2011). 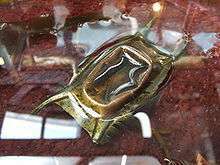 "Animal egg as evolutionary innovation: a solution to the 'embryonic hourglass' puzzle". 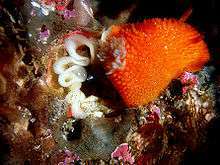 Journal of Experimental Zoology (Molecular and Developmental Evolution). 316: 467–483. doi:10.1002/jez.b.21417. ↑ Reitzel, A.M.; Sullivan, J.C; Finnery, J.R (2006). 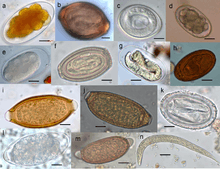 "Qualitative shift to indirect development in the parasitic sea anemone Edwardsiella lineata". Integrative and Comparative Biology. 46 (6): 827–837. doi:10.1093/icb/icl032. ↑ USA, David O. Norris, Ph.D., Professor Emeritus, Department of Integrative Physiology, University of Colorado at Boulder, Colorado, USA, James A. Carr, Ph.D., faculty director, Joint Admission Medical Program, Department of Biological Sciences, Texas Tech University, Lubbock, Texas, (2013). Vertebrate endocrinology. (Fifth ed.). p. 349. ISBN 0123948150. Retrieved 25 November 2014. ↑ Hamlett, William C. (1989). "Evolution and morphogenesis of the placenta in sharks". Journal of Experimental Zoology. 252 (S2): 35–52. doi:10.1002/jez.1402520406. Retrieved 25 November 2014. ↑ Jerez, Adriana; Ramírez-Pinilla, Martha Patricia (November 2003). "Morphogenesis of extraembryonic membranes and placentation inMabuya mabouya (Squamata, Scincidae)". Journal of Morphology. 258 (2): 158–178. doi:10.1002/jmor.10138. Retrieved 25 November 2014. ↑ Gorbman, edited by Peter K.T. Pang, Martin P. Schreibman ; consulting editor, Aubrey (1986). Vertebrate endocrinology : fundamentals and biomedical implications. Orlando: Academic Press. p. 237. ISBN 0125449011. Retrieved 25 November 2014. ↑ "Online Etymology Dictionary". Etymonline.com. Retrieved 2013-07-27. ↑ L'ou com balla, Barcelona Cathedral. Wikimedia Commons has media related to Egg.